It's time once again for everybody's favorite hyperintelligent duck to shamelessly give the business to an innocent, unsuspecting anime. I'll admit some reluctance to use the term "innocent" to describe Vividred Operation, as it seems very much like the Production Staff's familiarity with the word is passing at best. Still, that's what makes these things so much fun, right? I suppose an argument can be made that using the word "fun" to describe these episodic writeups may not be appropriate, but that's not for me to say. I just write 'em and let you, my intelligent, good looking, well-dressed readers, make the call. By the way, have I mentioned how great your hair looks? Because it's flat-out amazing. How do you get it to do that feathering-and-flip thing? Seriously, I envy you your hair. We pick up Ep02 pretty much where we left off in Ep01, with Akane (left) ascended to Magical Girl status amd Aoi (right) gazing lovingly into her eyes. Just then, Gendo Plushyferret says that the two of them are the only people in the world that can fight the alien invaders, and they've got to prepare for docking. Docking? As in "symmetrical docking"? I've completely changed my mind about this series, I'm all over it now! Man, Vividred Operation has really moved into the big leagues now: it's got an OP and everything! Too bad I'll never watch it... I actually (almost) never watch a show's OP, simply because of the spoilers that are usually contained therein. That is, if I actually care about the series; if I don't, I'll watch once. Yes, I know there are series where the OP is part of the show (the ARIA franchise) or changes every episode (the most recent HidaSketch); obviously that's different. But in general, I'd rather be surprised. Okay, now that I've got that out of my system, where's my docking? Post contains 2390 words, total size 19 kb. I think those are supposed to be F-35's. And having the two girls flying in formation with several of them was pretty awesome. An interesting thing about the dark haired girl: she has something that looks like a glowing flower on her collar, and one of the petals on it went away when she fired her bow. It's like she has a limited number of shots, and she just used one up. And clearly the magical girls have something like superman's "Strength Field" that lets them lift Raptors by the radome without snapping it off. Looking at the damage to the carrier deck... I wonder if there's a TV Tropes for "Everything is made of stone" based on the way things break into concrete rubble when smashed. 5 Totally F-35. It only has a single engine. It doesn't look like it has the port for the VTOL jet, so it's not that version. It may very well be the naval version. And now I shall demonstrate my nerdery: The first thought I had when I saw those F-22 looking things in the first episode was, "I thought those weren't going to be exported..." The second thing was that they only had one engine, upon which I actually looked it up. 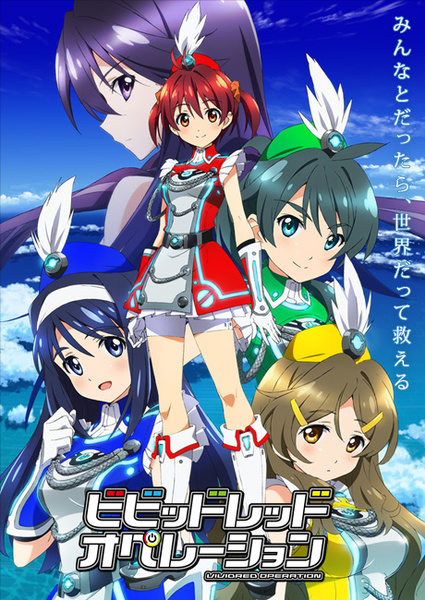 So there's really only one show that I'm even mildly excited about this season, and that's this one, Vividred Operation. As I mentioned in the previous post, nobody has the faintest idea what's going to happen with it: it could be great, it could be stupid, it could be stupidly great! Well, no matter how it shakes down, I'll be doing episodic reviews for it, probably on Saturdays. It airs on Thursday, but there's that whole work thing to think about... I'm not as young as I used to be, alas. I don't have as much energy, as much hair, or as many teeth as I did when I was a kid. So let's take a look at this here show, let's see what we're being given to work with, shall we? ...there's this young woman, standing on the safety railing on the very top of the tower, watching the sun come up. Completely unbelievable... I mean, there's not a single iPhone or camera in sight, and there's no way one of today's callow yoots wouldn't be recording this to post on myfaceinatube.com... with the camera held the wrong way. Kids these days, I tell you. Oh, so it's going to be THAT sort of show, huh? Technically, she is wearing pants. Lil' Miss Wallenda up there is, apparently, a member of O2STK, and nothing she does while on-screen clarifies her reason for existing. Yup, it's gonna be a good show for me. Post contains 2671 words, total size 21 kb. 1 I had a "wait, what?" moment in this episode. Momo complains at one point because they don't have any money. But there are a thousand companies in the world who would be willing to pay huge to get the plans to that flying bike. By all rights they ought to be hugely wealthy. 2 Yup. Never mind the whole Infinite Phlebotinum Engine, the flying bike should have made him rich... but then, he DOES have a radio-telescope dish in his back yard. 3 Yep, it's clear that the reason they don't have any money is because grandpa spends every penny of his massive patent licensing cheques on scientific widgetry. Now that he's a plushy ferret, the girls will live like kings! Also, that thing that attacked the planes and ships and whatnot? It's totally a runaway planetarium projector. 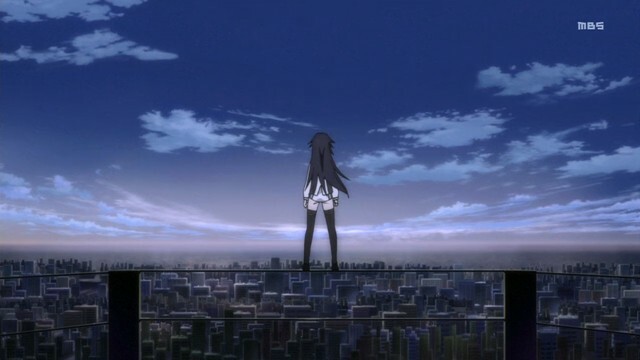 5 I don't know why I bothered hoping that her fear of heights would actually last as a plot device for any length of time. "Oh, I'm cured of that now." Uh... huh. Sigh. 6 Oh, and you're not the only one. "Oh, it's vivid red. Gotcha." Too many viewings of "Vandread" over the years? Guilty as charged. 7 "A replacement key for a Prius..."
8 Ow, my sides hurt from laughing. 9 Marketing is getting ready to sell USB drives that look like the key. Great idea, developing the only means of defense and keying it to a middle school girl who's afraid of heights and so hard hasn't shown the slightest hint of fighting skills, unless she means to bean the aliens with newspapers. The one thing that bothered me about the whole tiltrotor thing is they pointed out that it ran off of UncleFester Engine energy, and I said "Then why does it have turbine air intakes?" The other thing is that Ospreys have carbon fiber fuselages. They wouldn't break like that. 10 Watching the helicopter manufacturing process and Ospreys being built made working at Bell Helicopter a wonderful time. "Then why does it have turbine air intakes?" Because it's a conversion from something that did burn distilled dinosaur, rather than something designed from the ground up with an UncleFesterCo plant? My friends, I have a question for all of you. As I'm sure you've noticed, my writeups for Ben-To! are occurring at a rate that makes snails seem fast. I've been busier at work than I was expecting, and since it's an old show, I feel like I can "relax" with it. But I couldn't do that with a show that's currently airing, and that's where the question comes in. 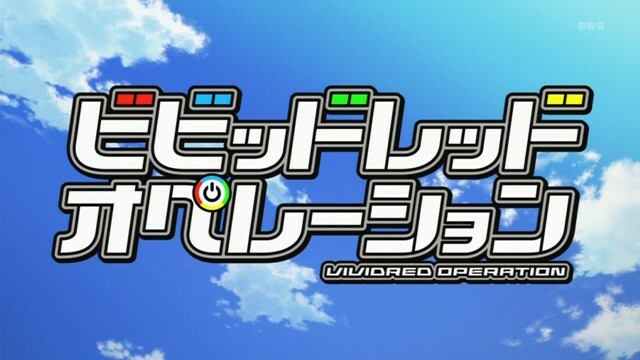 Vividread Operation has just begun to air over in Japan, and it seems to hold great promise as a subject of a Wonderduck Writeup. SDB calls it a cross between Strike Witches and Nanoha, and I suppose that's correct, though to me it leans more towards the 'magical girl' side of the spectrum. Whatever, I can see it being just as singularly stupid as Rio Rainbow Gate!, or as singularly good as Ga-Rei Zero. So I leave it up to you, my friends and readers, the accumulated Pond Scum: do I finish Ben-To!, or do I drop it and go with Vividred Operation? 1 Did he just call us Pond Scum? 3 I think it's evident that your heart isn't into Ben-to. If you're asking us, it's clear you want to switch. So go ahead and do so. 4 Steven is wise beyond his years. Go with VRO. 5 Change up to VRO. If you don't like where it's going, you can always drop back to Ben-To. 6 Gotta go with the crowd. 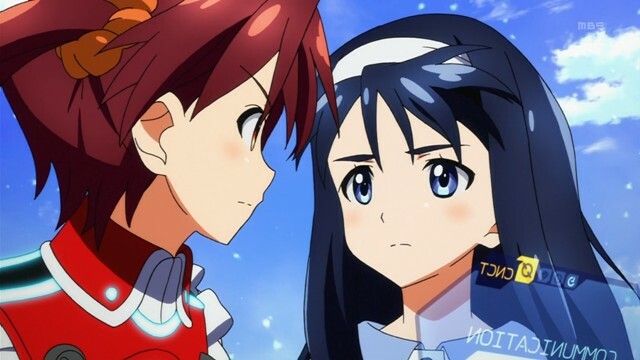 Vividred looks interesting. 7 I'd say switch. I mean, like I'm going to get back to Deadman Wonderland? Who would care at this point? 9 I'll chime in for Vividred. Go ahead and make the change. 10 Am I the only one with a soft spot for Desaturation Lass? My vote is for Ben-To, but it looks like I will be out-voted. 11 Eight out of ten dramatic ferrets prefer Vividpants. Red. Vividred. Did all the female characters have colours for names? I noticed Akane, Momo, Mashiro, and Aoi. 12 Follow your bliss. I never really got the point of Ben-to. 13 Vividred. Go for it! 14 Of course, you could also try watching Rio Rainbow Gate! through a blue filter. See what that does. 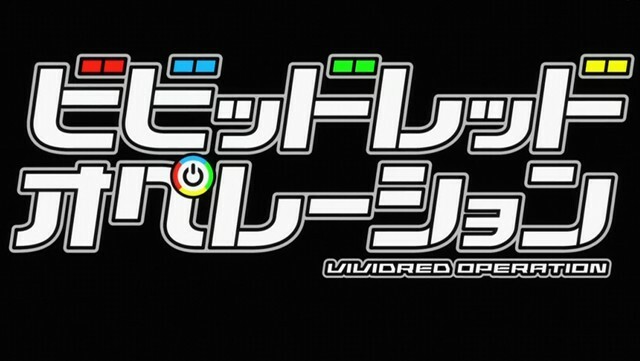 16 So, looking at the logo for Vividred, we're waiting for girls named Midori and Kiiro to show up. Over at Brickmuppet's place, a recent contest (whyasnake) brought his favorite manga to the light of day. 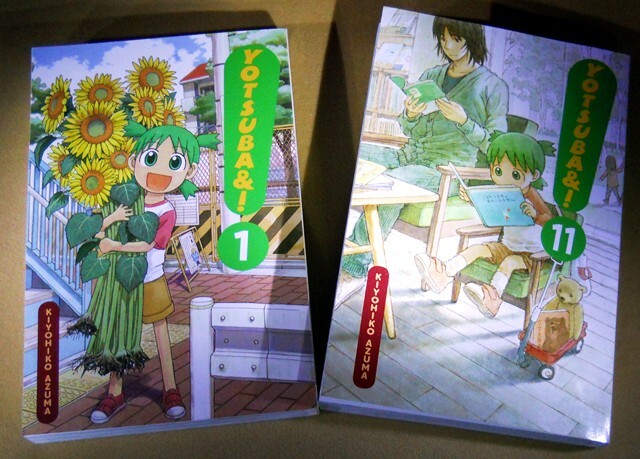 As with all right-thinking individuals, it turns out that it's Yotsuba&!. Careful readers of The Pond will remember that I have a special place in my torso for that title, which explains why it has to be my favorite manga of all time. But let's face it, that doesn't make for a particularly exciting post, so I'm going to dig a little deeper into the stacks of manga in my collection to find two other favorites! Join me, won't you? 1 Wait, there's finally a new GSG release? Just one more to go, GD... just one more to go. Panzer Vor (If You Know What I Mean)! One of the many surprises involving the recent series Girls und Panzer was the lack of heavy fanservice. Oh, don't get me wrong, the girls are cute and pleasant to look at, but pretty much the only true fanservice shots are for the tank aficionado. Oh baby, do those treads go all the way up? Being devoted to my readers, I've decided to take on the challenge of providing suitable coverage of this OVA for your edification. Join me, won't you, in an excursion into GuP OVA #1: Water War! Post contains 761 words, total size 6 kb. Actually, I am deeply disappointed. I'd seen the shot of the SCUBA suit and thought they were subverting the trope. alas...this instead of # 11. 2 Okay. I have a person-who-doesn't-know-very-much-about-tank-design question. I looked up the tanks used in the series (mostly on Wikipedia, I must admit) to get some historical perspective. The Churchill was noted in the wikipedia article for having "all-around tracks", which must mean something other than I think it means...because I know what a track is and how it works on a tracked vehicle. What are "all-around tracks"? Is this an historical reference or an engineering reference? 3 I think what that means is that the top part of the track goes higher than the side of the chassis. Why that might be a good thing is beyond me; it can't have been very important because the Sherman and T34 didn't do that. 4 Here's a great picture of a Churchill's treads. One advantage of this tread design is that you can put hatches in the side of the hull. Whether they are useful is another question. 5 It would seem, then, that the "all-around track" on the Churchill was primarily a holdover from the Mark I - IX tanks. It would seem, then, that the "all-around track" on the Churchill was primarily a holdover from the Mark I - IX tanks. Only in terms of design requirements. The Churchill was designed to fulfill the British Army's requirement for an infantry tank. As the term suggests, such AFVs were intended to provide direct support for the infantry. As such, an infantry tank did not need to be fast, but it did need to be able to go anywhere that the infantry could go. Running the track over the chassis/hull, as well as equipping it with extra road wheels, gave the Churchill arguably the best all terrain performance of any tank of WW2. It would not be able to win races on the road (Even when new, and the Churchill, like people, got slower as it got older and put on weight. ), but it could handle steeper slopes than any other tank of the era, and move better over rough country than most. Since the infantry it supported could not walk any faster but often did have to fight in terrain that would prevent the use of other AFVs, the performance advantage was very significant. Incidentally, the rhomboid shape used by the WW1 British tanks might given them the best poor terrain performance of any AFV deployed - but their lack of suspensions or shock absorbers detracted from that advantage. 7 I think the Churchill could probably climb over a higher barrier (e.g. a stone wall) than a comparable tank whose track didn't do that. I think the Churchill could probably climb over a higher barrier (e.g. a stone wall) than a comparable tank whose track didn't do that. Of course, even if a tank could climb over a barrier like that, most tanks and their crews would not risk it if there was enemy opposition. It is usually much better to find a way around, or wait for the engineers to blow a hole through, than climb a barrier in a tank. One of these things is not like the others / which one is different, do you know? I suppose it's possible to find more wildly dissimilar shows than HidaSketch and Black Lagoon, but you'd have to work at it. Both are really good shows, but in completely different ways... and that just made me think of a crossover between the two series. That makes me weep. Yuno in Roanapur? Sawyer the Cleaner at Hidamari Apartments? Wait... that one would be pretty cool, actually. I think I need sleep now. Well, I have all of those, but they didn't come in the same box. 2 My last manga order had Berserk, Hidamari, and GA in it. Cross THOSE over, why don't yez. 4 Amazon.com once recommended Elfen Lied to me because I had seen Bottle Fairy. 5 Don, you say that like it's inappropriate. Did you watch Chuunibyou Demo Koi ga Shitai! (aka "Chuu2") when it aired in the Fall season? If you didn't, you've missed something awfully special. I'll admit, I was unable to watch it when it was airing, but I've made amends for that. Wow, is this a good show. The basic setup is simple: guy goes to highschool intent on leaving his fantasy-tainted youth (he called himself "Dark Flame Master"... in public) behind and just live a normal life. Then he meets... her. Rikka, possessor of the "Tyrant's Eye." Or a colored contact lens. One of the two. Unlike Our Hero, she still believes in her fantasy-tainted youth; in fact, she lives it whole-heartedly. I'll be honest... I was embarrassed on her behalf for the first episode. Not like I emphasize with her or anything, heavens, no... I'm merely a hyperintelligent duck with the ability to type. If you can get past that initial embarrassment, however, you find yourself in the middle of the best anime in quite a while, perhaps of all of 2012. Along the way, Rikka decides to form a club and somehow manages to attracts other fantasists, including a cheerleader, an upperclassman, and a middleschooler, to her side... oh, and the Dark Flame Master gets dragged along, too. Hijinks ensue. Ridiculously entertaining hijinks, might I add. There is a story being told here, which reveals itself around Ep06 or so, but it's a touching one, never angsty without good reason. And for every angsty bit, there's humor and action aplenty, usually at the same time. 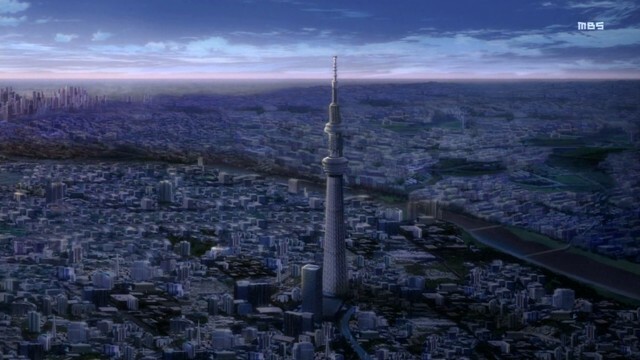 It should come as no surprise that, as a Kyoto Animation series, it's absolutely gorgeous. Details that other companies would gloss over or ignore altogether get nearly as much attention as the main images. Characterization is new and fresh, and I found myself actually caring about them. For a flinty-souled duck like myself, this came as a stunning surprise. I cannot recommend this show highly enough. Go watch it. What are you waiting for? UPDATE: I neglected to mention something. Blogsuki nailed it with his description of Rikka as an opposite-Haruhi Suzumiya. Rikka doesn't have powers but acts like she does. Haruhi DOES have powers, but doesn't realize it. True, there's almost nothing else similar about them, but it's an excellent observation about their respective personalities. Haruhi would simply hate Rikka... or pity her, which is even worse. 1 I got a few episodes in and just wandered off. It's cute, it's pretty, it has good characters, I just don't know why it didn't 'grab' me. 2 Watched each ep as soon as they were subbed by Mazui. Loved it. 3 Started watching it after this post. Just got to the scene where Rikka's house used to be in episode 7. It was a bit heartbreaking watching her go through her "magic start up". 61kb generated in CPU 0.08, elapsed 0.1995 seconds. 51 queries taking 0.1368 seconds, 277 records returned.